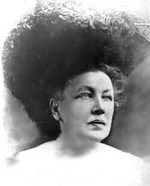 In the fall of 1901 Annie Edson Taylor took a trip that she thought would bring her fame and fortune. 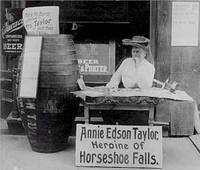 On her 63rd birthday the former school teacher climbed into a barrel. 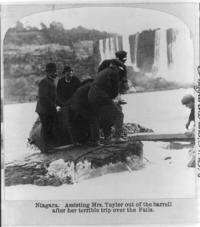 The hatch was closed and the barrel was set adrift above Niagara Horseshoe Falls. She began a voyage that day that only a handful of people over the last century would live to tell about. She began her life in Auburn, NY and grew up with a comfortable lifestyle. Although her father passed away when Annie was 12, his inheritance left them in a style the family was accustomed to. At 17 Annie met David Taylor, and after a short courtship they were married. A baby followed but passed away within days of being born. At 25 she became a widow after David was wounded in the Civil War. After a stint in San Antonio, Texas as a school teacher, she decided to move back to New York State where she became a dance instructor. She liked the finer things, and as her parent's inheritance began to run out she became more desperate to make ends meet. The thought of living a life with less than finer things literally "drove her to the brink". "Don't Try It,” She Advises Others. NIAGARA FALLS, N. Y., Oct. 24. 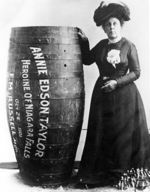 -- A widowed woman, Mrs. Anna Edson Taylor, safely passed over Niagara Falls in a barrel this afternoon. The trip from end to end was witnessed by several thousand people. The fact that Mrs. Taylor failed to go on Wednesday did not lessen the confidence of the public in her. Still everybody was agreed that it was a foolhardy trip. It was beyond any conception but her own that she would live to tell the story. But she is alive to-night, and the doctors say as soon as she gets over the shock she will be all right. This initial voyage over Niagara's cataract began at Port Day, nearly a mile from the brink of the Falls. From Port Day Mrs. Taylor and her barrel were taken out to Grass Island, where she entered the barrel, and at 3:50 she was in tow of a boat speeding well out into the Canadian current. At 4:05 the barrel was set adrift, and Mrs. Taylor was at the mercy of currents in waters that never before have been know to spare a human life once in its grasp. From the spot where the rowboat left the barrel the current runs frightfully swift and soon breaks over the reefs that cause the water to toss in fury. The barrel was weighted with 200-pound anvil, and it floated nicely in the water, Mrs. Taylor apparently retaining an upright position for the greater part of the trip down the river and through the rapids. Fortunately the barrel kept well within the deep water, and except for passing out of sight several times, in the white-crested waves, it was in view for the greater part of the mile. In passing over the Horse Shoe Fall the barrel kept toward the Canadian side at a point 300 feet from the centre. It dropped over the fall at 4:23 o'clock, the bottom well down. In less than a minute it appeared at the base of the fall, and was swept down stream. The current cast it aside in an eddy, and, floating back up stream, it was held between two eddies until captured at 4:40 o'clock. As it was landed on a rock out in the river it was difficult to handle, but several men soon had the hatch off. Mrs. Taylor was alive and conscious, but before she could be taken out of the barrel it was necessary to saw a portion of the top away. Her condition was a surprise to all. She walked along the shore to a boat, and was taken down the river to the Maid of the Mist Dock, where she entered a carriage and was brought to this city. She is suffering greatly from the shock. She has a three-inch cut in her scalp back of the the right ear, but how or when she got it she does not know. She complains of pain between the shoulders, but this is thought to be from the fact that her shoulders were thrown back during the plunge, as she had her arms in straps, and these undoubtedly save her nick from breaking. In passing over the falls she admits having lost consciousness. While thanking God for sparing her life, she warns everybody against trying to make the trip. So severe was the shock that she wanders in her talk, but there is little doubt but that she will be in good condition within a day or two. Three doctors are at her bedside to-night. Mrs. Taylor is forth-three years old. She wasborn in Auburn, N. Y., and has crossed the American Continent eight times. During her stay here she has impressed everybody with her wonderful nerve. The barrel in which Mrs. Taylor made the jouney is 4 1/2 fee high and about 3 feet in diameter. A leather harness and cushions inside protected her body. Air was secured through a rubber tube connected with a small opening near the top of the barrel. Mrs. Taylor is a school teacher and recently came her from Bay City, Mich. She was born in Auburn, N. Y., and is forty-three years old. She has cross the American Continent from ocean to ocean eight times. A fantastic rendition of Annie's story told by Radio National in Australia. Their program is called Earshot. Here is a link to the page this podcast came from. Perhaps Annie's vanity got the best of her when she knocked twenty years off her age. The trip over the Falls in a barrel never brought her the money she had hoped. She died destitute in Lockport, NY April 29, 1921 at the Lockport Home and Infirmary. The Oakwood Cemetery Association donated a grave to honor her place in Niagara Falls history. She is buried next to fellow riverman Carlisle D. Graham. Also in the same row is Captain Matthew Webb, first man to swim the English Channel, and Francis Abbott, "the Hermit of Goat Island". To see Annie's marker, turn right after entering the gates from Portage Road. Follow the road on the south side of the cemetery until you come to the first "Fork". Annie is in the third row at the point of the "Fork". 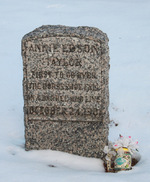 Thanks to Wikipedia, and Bay-Journal.com for information on Annie.